While negotiating the lunch hour traffic yesterday, I caught a piece of a conversation on the radio and thought, “That person has read Danah Boyd’s book”. As the conversation went on, I realized the speaker was Danah Boyd, and that she was a guest on the Ontario Today call-in program on CBC Radio. The program was about parents spying on and creeping their teens, but it turned into a conversation about much more. 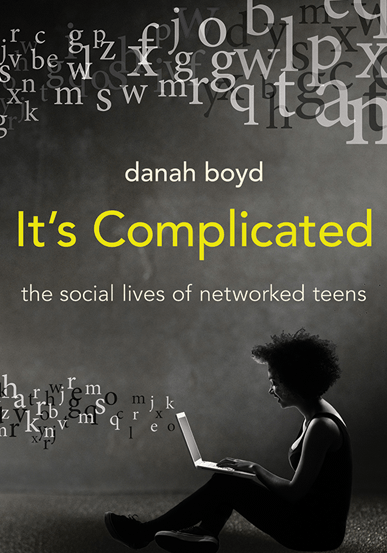 Danah Boyd is such a fluent speaker on the topic of networked teens that she can turn any question into a learning moment. Her key messages are important take-aways for parents and teachers of teens. It takes a community to raise a child. At one time we did that openly, in public spaces, but now much social activity has moved into online spaces. It doesn’t mean we shouldn’t look out for kids in the same way. Surveillance is observation without intervention. When parents and other adults discover inappropriate online activity, they need to take time to consider whether an intervention is necessary, and what the intervention should be. Behaviour on social media is reflective of other realities in teen’s lives. Ask why kids are behaving that way. What is going on in their lives that is making them seek attention inappropriately? What supports are needed? Let’s ensure that our adult reactions to teen online behaviour are not based on our own lack of understanding, or our unfounded fears of online spaces. Our interventions should enhance the abilities of young people to make good decisions, not take the decision-making process away from them. The full Ontario Today podcast is available here: http://www.cbc.ca/ontariotoday/2014/05/29/when-keeping-an-eye-on-the-kids-becomes-spying/ or through itunes. Danah Boyd’s book is available for free download here. And What About High School? Have a great Friday, and thanks for posting! Thanks for taking the time to continue the conversation, Brandon. I am a huge fan of this book because it is written from a place that honours the needs of teenagers. It challenges adults to address their fears and misconceptions and advocates for appropriate support for teens who are behaving dangerously online. I look forward to further conversations on this topic. How can we, in the school system, use this understanding to give kids the tools they need to use social media to their best advantage? Great post Donna. There is definitely a fine line between allowing children/students freedom online and intervening in an inappropriate situation. I like what you said about adult reactions. Adults need to observe and, of course, intervene when necessary but reactions can’t be knee-jerk (which they often are) My feeling has always been that the intervention should be a time have a discussion, a kind of “teachable moment” with the student/child to discuss their digital footprint and online identity. Sadly, I think we are still, even in 2014, at a point where many people, not just kids, don’t think before they post.